Cat people, rejoice! A purrrfect documentary prowls into theatres this week at Kedi hits the screen. This ‘catumentary’ profiles the street cats of Istanbul, Turkey and the surrogate owners who tend to them. The doc lets audiences take a tour of the city from a cat’s eye view and the perspective is a surprisingly life-affirming lesson on kindness and compassion. Kediis sure to be one the year’s best docs. Read the POV review of Kedi here. Fans of Tickled might want to catch this week’s other new opener My Scientology Movie from John Dowler and Louis Theroux. In the vein of Tickled, this doc takes a comical investigation into a secretive pocket of society as the filmmakers probe the controversial Church of Scientology. More enjoyable than enlightening, this darkly funny exposé invites more questions than answers and offers far more laughs on the subject than one finds in Alex Gibney’s recent doc Going Clear. Read the POV review of My Scientology Movie here. February’s offering for Doc Soup Sundays at the Hot Docs Ted Rogers Cinema is Floyd Norman: An Animated Life. 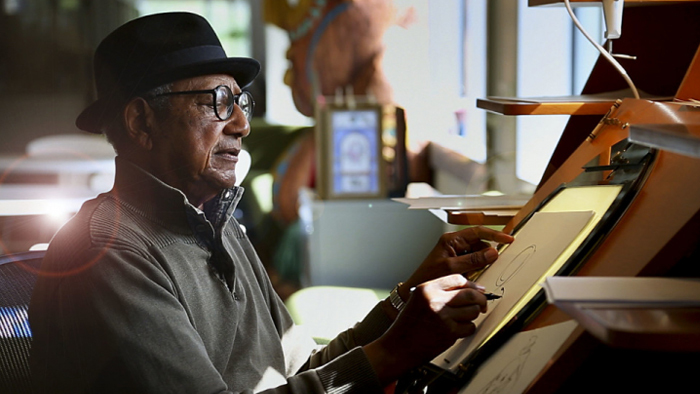 The film pays tribute to prolific animator Floyd Norman in a fun talking heads piece that lets the iconoclastic octogenarian tell his story as Disney’s first African-American animator working on hits such as Sleeping Beauty and Mary Poppins. The doc is a smart serving for Doc Soup given that it’s both Black History Month and one week until the Academy Awards. An Animated Life is necessary viewing in the era of #OscarsSoWhite. Read the POV review of Floyd Norman: An Animated Life. On the Canadian front, the Gordon Pinsent doc River of My Dreams expands to additional markets, while KONELĪNE: our land beautiful lands in Ottawa at the ByTowne for a fundraiser event. Dir. Fred Peabody | Canada | 91 min. Dir. Michael Fiore, Erik Sharkey | USA | 94 min. —>Filmmaker Michael Fiore will be in attendance for a Skype Q&A with Floyd Norman. —>Family Day special: Tickets are free for those 16 and under on Monday, February 20. Dir. Nettie Wild | Canada | 96 min. Dir. John Dowler and Louis Theroux | UK | 100 min. Dir. Brigitte Berman | Canada | 104 min. -Vancouver, BC: Cineplex Park Lane – Fri, Feb. 17 – Tues, Feb. 21. Dir. Jeff Stilson | USA | 2009 | 96 min. Dir. Paul Émile d’Entremont | Canada | 2012 | 84 min. —>Panel discussion with representatives from Ottawa LGBTQ and refugee organizations to follow. Dir. Wim Wenders | Germany/France | 103 min. Dir. Thomas Riedelsheimer | Germany/Finland/UK/Canada | 90 min.